Where has the time gone this summer? We can’t believe that we’ve only got a couple more weeks of fishing left, then it’ll be a wrap for the 2017 season! 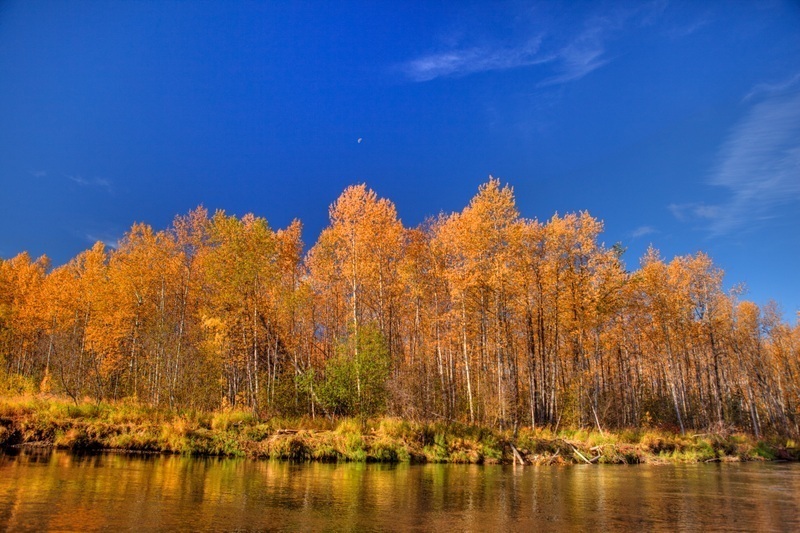 As is typical for this time of the year, the temperatures are dropping, the colors are starting to change from the rich lush greens of summer to the vibrant golds, reds & oranges of fall on the Anvik. 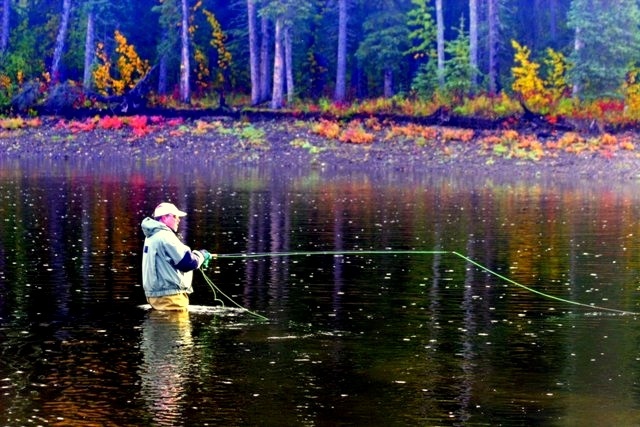 The fish runs are switching from the big ole’ king salmon to the acrobatic & always plentiful silver (co-ho) salmon. Since our last post we were blessed with some more rain which we needed. There was actually some pretty significant weather events during late July that muddied our usually gin clear waters for a few days. And as is usual after a good down-pour the waters cleared again in a short time. As we’ve always known, when your in business with mother nature, you never know what each season will bring to this remote wonderland. For the majority of the time this summer has been a dream. Great fishing, great weather and very few mosquitoes here on the Anvik River. Our guests have been coming back to camp after a day on the river with smiles on their faces, worn out arms and lots of stories to share. We had a couple of guests from New Zealand who joined us for ten days on the Anvik and I’m sure they’re still telling stories. They were able to catch plenty of fish, enjoy the hiking opportunities, shoot trap like experts, drift the river looking for bear and other wildlife and of course just really enjoy the great camaraderie that folks find here. Some night around the campfire we laughed until we were almost in tears with these guys. Then there was the “Raven Clan” that visited early August. This is a family that really enjoyed their time here and knew how to make everyday fun. Whether it was wrestling the guides on the gravel bar during lunch, corn-hole competitions after dinner or just soaking the splendor of the Anvik in while drifting the river – it is always so wonderful to see our guests have such a good time. It really is much more than a fishing trip when you join us for an adventure. 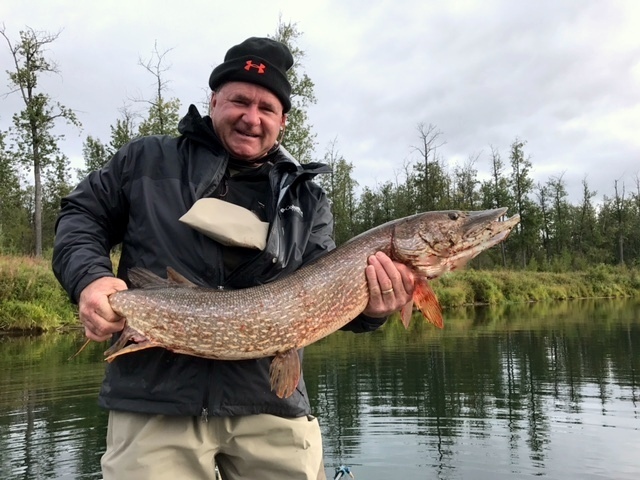 Nice catch – Anvik River northern pike! ANVIK RIVER FISHING REPORT: – The fall chum salmon numbers through the Pilot Station sonar are well above average this season with over 1.7M being counted thus far. The Anvik is home to the largest summer chum spawning run, but we only get a small percentage of the fall chum salmon. What these fish lack in numbers they certainly make up for in size. The fall chum salmon have a much larger girth than the summer chum salmon and a quite a bit bigger over all. It’s not unusual to catch a 10 to 12 pounder. Our cohos are starting to show up in their usual big numbers. They started showing up as expected mid-August, but didn’t really kick in until this past week. The run numbers look to be of average amounts for this date. That being said, they’re here now and are beautiful vivacious fish that are a blast to hook into! UPDATE: – Here’s a big shout out to Tim from Wisconsin and Coleman from Michigan. Each of these guys achieved the feat of getting their grand-slam and century club in one day! That’s a lot of fishing and a ton of catching! Great job Tim & Coleman! Since our last post our Grand-Slam Club numbers have increased by 8 women & 13 men. This brings our 2017 season total to 70 Grand-Slam Club members and 5 Century Club members – Congratulations to everyone!